The Future of Chatbots for Social Media. With more and more brands using chatbots for social media, we look at how they'll develop in 2018 and beyond. 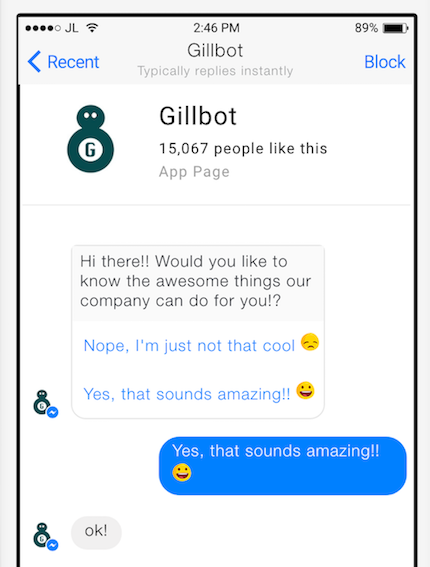 When Facebook announced they were introducing chatbots into Messenger, the digital marketing world went crazy. Suddenly everyone was talking about bots—how they were going to use chatbots for social media, customer support, pre-sales service, and anything else they could think of. Within days, Facebook chatbots had reached the legendary ‘peak of inflated expectations’ according to Gartner’s Hype Cycle model. But by the time 2017 rolled around, the hype was over and social media chatbots seemed to disappear from the agenda. Social media marketers had an amazing new tool, but no one seemed quite sure what to do with it. This came as no surprise after VP of Facebook Messenger David Marcus declared the technology “overhyped”. In the meantime, other tech companies were developing similar functionality, allowing businesses to build native chatbots for websites or embed them in their own applications. But marketers remained conflicted. We know that customers often need help to complete transactions for instance—but are they really going to be happy talking to a bot? Surely Facebook bots are the complete opposite of the personalized experience our clients crave? And for some, this is where the chatbot journey ended. The reality is that customers regularly need to contact your business—some surveys suggest that over 80% of online shoppers need assistance to complete a purchase. But in the 24/7/365 digital marketplace, hiring enough employees to cope with this demand is incredibly expensive. For most, this means defaulting to email and a vague promise of replying ‘within two business days’. Customers used to social media and instant gratification won’t wait, however—32% expect a meaningful response in just 30 minutes. Email is also at odds with customers’ preferences—most will choose to use messaging apps before email or phone. This means there is a genuine use case for chatbots. Although social media bots have apparently disappeared from the public consciousness, some brands have been hard at work behind the scenes. At the 2017 F8 Conference, David Marcus (yup, same one) announced that over 100,000 Facebook bots were active on the Messenger platform. These chatbots are popular with consumers too—over two billion messages pass between customers and brands every month using automated systems. Predictably, customer service has been the most popular use case for social media bots. Their ability to answer high-level customer queries without involving agents is particularly attractive, giving customers what they want and helping to lower costs. More than half (61%) of all chatbot interactions are related to answering high-level customer queries. Social media chatbots are picking up momentum—and they should (finally) reach mainstream acceptance during 2018. The success of early adopters–and customer enthusiasm for the technology—means that other businesses will spend 2018 joining the automated service revolution. The longer an organization resists the development, the harder they will find it to compete in the digital marketplace–and to meet their clients’ needs. A chatbot on Facebook Messenger in action. Source: GIPHY. Simply providing chatbot functionality will not guarantee success, however. Firms will need to carefully plan their chatbot strategy to ensure that it meets customer needs—otherwise they could end up repelling the very people they are trying to attract. The investment of time and effort will be repaid however—Juniper Research predicts chatbots will help businesses reduce costs by more than $8 billion per year by 2022. Most current chatbots are built around traditional text input—but increased reliance on voice-activated personal assistants (Google Now, Siri, Cortana, etc.) will drive new developments. In the future, chatbots will use “conversational APIs” to accept and process natural language queries, allowing customers to ask questions and receive more natural responses. Look at what Amazon has achieved with Alexa, and then consider how your business could leverage similar technologies to benefit clients. Voice-activated personal assistants like Amazon’s Alexa will continue to develop in 2018. Source: GIPHY. Customer demand for personalized experiences will continue to grow. During 2018, you should expect to see chatbots and messaging platforms embedded into websites to deliver enhanced customization and interactivity. As well as delivering personalized recommendations to visitors, sites will update in real time as chatbots “learn” through the course of a customer interaction. Think of the feature like an advanced search mechanism which combines chatbot input with historical customer data to deliver suggestions fine-tuned to their immediate desires. Ideally, you want to be able to leverage data already stored in your social media engagement platform to enrich your bot’s understanding of individual customers and their needs. Chatbots will eventually be linked to more applications throughout your business, giving rise to a new “Messaging as a Platform” model. The more data inputs available to the bots, the better they can serve your customers automatically. A book store’s chatbot uses prior customer data to make suggestions on future purchases. Source: GIPHY. Your marketing department will be familiar with the concept of marketing personas, used to define your ideal customer and their interests. By building a persona, you can humanize raw marketing metrics and prepare to personalize future campaigns. By creating a persona for your chatbots it becomes possible to humanize them, making every customer interaction more natural and engaging. Your marketing team will need to work alongside developers to inject personality into the language they use to respond to customers. Both parties must ensure that every interaction is on-brand and help to create a consistent experience for users that replicates all of your other communications channels. Adding a little personality to your chatbot can take your customer experience to the next level. Source: Chatbots Magazine. Early chatbot deployments may have been flawed, but the latest developments show that this is a technology with genuine benefits for you and your customers. People want speedy, effective support and bots are a great way to meet that demand. 2018 will be the year that social media chatbots move from over-glorified FAQ machines to AI-powered agents that deliver personalized services across all of your whole digital network. The question is, how will your business build and manage a chatbot-powered communications channel that fully engages your ideal customers?